At BraunAbility we love to hear stories of customers who ignore the common stereotypes of their disability anddefies their handicap. I recently talked to such a customer - Curtiss Wilson of New Mexico - who was born with Osteogenesis Imperfecta (OI), or "brittle bone disease." The dominant characteristic of this genetic disorder is fragile bones that break very easily. Curtiss estimates he's had at least 300 fractures over the course of his life. With a disease like this, you might think Curtiss would play it safe. No unnecessary risks like driving or taking vacations - maybe he could just take up quiet hobbies like reading or painting, right? Instead, Curtiss is an active outdoorsman who enjoys everything from fishing to target shooting to hunting with family and friends. To make these hobbies a reality, he drives a Toyota Sienna with a BraunAbility Rampvan conversion, which he drives with specialized controls. These hobbies come with their risks, of course, but it's worth it to Curtiss. 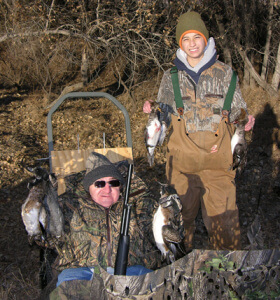 "When I'm hunting I have to make sure I use a certain caliber gun to reduce the risk of injury," he explains. Curitss is gearing up for an especially exciting hunt later this year - an oryx (a species of African antelope) hunt at the White Sands Missile Range in New Mexico. It's a once-in-a-lifetime hunt, literally, as hunters can only apply once for a license. 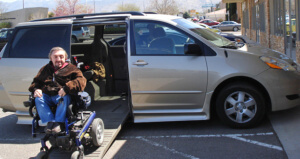 If he's not driving his Rampvan to his next fishing or hunting trip, he might be driving across the country to attend the annual Osteogenesis Imperfectanational conferences or to volunteer events of the New Mexico State University Alumni Association. And when he's not on the road, he's at work as an entrepreneur selling used accessible vehicles and medical equipment on-line. With a disease like OI, every activity has its risks - especially driving. But Curtiss feels secure in his BraunAbility Rampvan. In fact, he credits the van with saving his life. In 2007 his van was hit from behind at 40 to 45 mph. In an accident that would almost certainly have seriously injured an able-bodied individual, Curtiss only suffered a sprain to his right knee. "I think my BraunAbility Rampvan saved my life," he says, crediting the conversion design for absorbing much of the impact. Whether or not the Rampvan's design truly saved Curtiss from serious injury, BraunAbility is proud to offer a wheelchair van that has passed every safety standard and crash test. For a closer look at our most recent crash tests, check out this previous blog. It's our privilege to not only keep our customers safe, but to make sure they keep up with their busy lives for individuals who defies their handicap, too. If you know of a customer like Curtiss who defies the stereotypes of wheelchair users, please let us know!